Todos sabéis que he pintado mi replica hace poco y quería dejar esta información en el foro para aquellos que quieran pintar la suya. Si mis informaciones no me fallan en 2010 el US ARMY dio permiso a los soldados a pintar sus armas, no estoy seguro si a todos los regimientos y unidades, pero en algunas fotos, videos y pelis hemos visto a los Navy seals y otras unidades especiales con sus armas pintadas. El documento oficial que les pasan a los soldados es el que detallo a continuación, lo malo es que los soldados una vez terminan el servicio deben devolver las armas en su estado original, al final del documento también les indican como hacerlo, estos americanos son la leche. El documento está en inglés pero es muy facil traducirlo y con las imagenes uno se va guiando bastante bien. 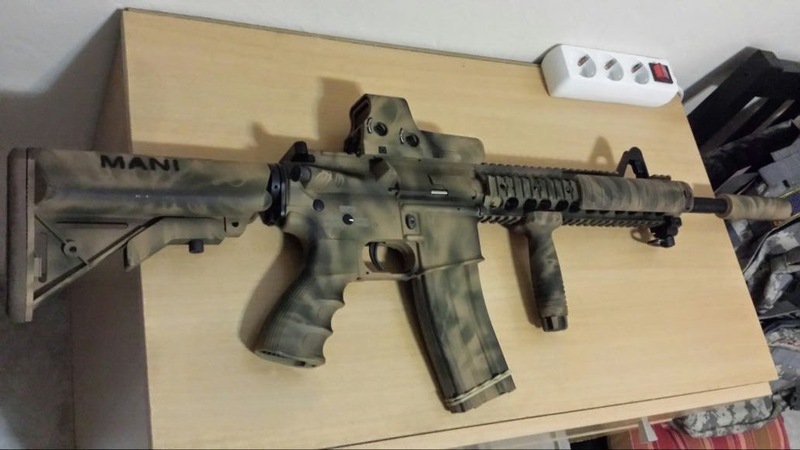 On 1 April, TACOM Life Cycle Management Command issued the Maintenance Information Message MI 10-040 “Camouflaging Specific Small Arms” stating that, given command approval, Soldiers are permitted to camouflage the M4/M16 weapon systems with paint. In essence, MI 10-040 is the Army’s “Weapons Painting 101” textbook. Soldiers should reference the full message before attempting this procedure. Presented here are PM Soldier Weapons’ crib notes for those Soldiers who have the green light to dress out their weapons with paint to reduce their visual signature on the battlefield. Before painting your weapon, it’s important that you keep several things in mind. First and foremost is to ensure that you have proper authorization from your superior to paint the weapon. Second, remember that the weapon needs to be stripped of all paint and properly cleaned before it is returned. Lastly, have a plan for how you want your camouflage to look. Painting a weapon is not about personalization, but increasing its tactical capabilities without impairing its ability to function. For your camo job to really stick, you have to ensure that all the dirt, grime, and oil are removed from the weapon. Begin by removing the bolt and bolt carrier assembly, charging handle, and any other attached items from the weapon and set aside. These components will not be put back in until the paint job is complete. The trick to effectively cleaning your weapon is dry cleaning fluid. TACOM instructs you don your protective gear and clean the down weapon twice with dry cleaning fluid. This ensures any oils that may not have been visible are completely removed from the weapon. Be sure to capture any dry cleaning fluid in a bucket or solvent tank in your work area. WARNING: It’s important to follow hazmat rules accordingly, as dry cleaning fluid is flammable and toxic to Soldiers and the environment. Use in a well ventilated area and do not allow any dry cleaning solvent to contact bare ground as it poses a significant threat to ground water. Conduct all painting and dry cleaning activities at a safe distance from water supplies. As with any task, so much of success depends on good preparation. If you do not properly protect the weapon from paint, you can negatively impact its performance. As a general approach, TACOM recommends that you start masking at the rear of the weapon and move forward from top to bottom. For M16 fixed-stock rifles, be sure to mask the buffer tube drain hole and buttstock screw. 1. With the upper and lower receivers engaged by just the front take-down pin, stuff the inside of the upper receiver with paper towels. Do not stuff paper towels into the barrel extension or chamber of the upper receiver. 2. With the weapon still broken down shotgun style, take a paper towel and place it over the top of the lower receiver covering the whole opening of the top of the lower receiver. 3. Sandwich the paper towel by closing the receiver and secure with rear take down pin. 4. Remove excess paper towel sticking out the sides and rear of the receiver. Make sure the remaining paper towel is stuck tight so that no paint will be able to get in between the upper and lower receiver. If it’s not tight, layer more paper towels across until it’s snug. 5. Mask off all the markings, including: IUID label, serial number, cage code, model designator, and selector switch position markings. 6. Mask all moving parts: safety selector, magazine release button, magazine catch, and forward assist. 7. Wrap trigger and trigger-well opening so no paint can get inside weapon. 8. Tape the iron sight. 9. Tape front sight post, post recess, and the two rear edges of the front sight. 10. Insert magazine(s) and paint only the exposed portions. 11. To paint the barrels, remove the bottom rail (if weapon has handguards, remove both) and mask off the complete barrel, front sight assembly, and slip ring. 12. Cover slot numbers on the rails. 13. Insert a foam ear plug into the barrel to protect barrel and bore interior. A laundry list of taping? Yes. But, every step is necessary to ensure the function or identification of the weapon is not compromised. 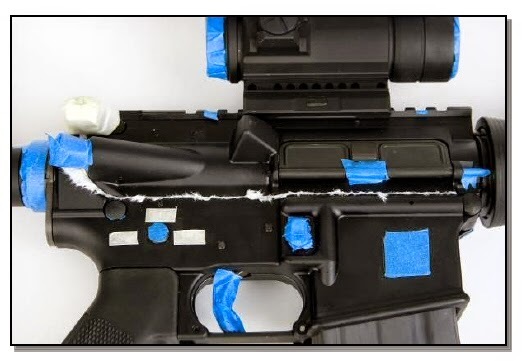 If your weapon has a component, sight, or accessory that was not covered in this procedure, use common sense to properly mask it.  Start with a plan.  Ensure you have proper ventilation.  Do not apply paint to the barrel and front sight assembly of the weapon. The heat of the barrel during firing will burn off the paint. Remember, “pretty” is not the objective of good camouflage. The goal is to break up the visual signature of the weapon system by blending your weapon in with your environment and uniform. If your operating environment has just light sand, then just paint your weapon tan with limited black breakup. If you are operating in a woodland environment, brown and olive drab with limited black breakup may be appropriate. If you have an adjustable buttstock, extend it before spraying. Spray thin coats with a light touch. Let the coats dry between applications. Test the cans on paper first to get a feel for how much pressure to apply for a particular flow rate. Looking for a template? Look to your local environment. One option is to layer local foliage or grasses on the weapon and paint around them to leave a natural-looking pattern. To blend colors effectively, first coat the weapon with the lightest color you will be using. Next take a darker shade that blends with your environment and paint stripes about four inches apart at a 45 degree angle. You can do this with one or two colors. Next, you need to blend it in. Take a dark color like green or brown and from about six to eight inches away from the weapon lightly dust the gun. After that, take a lighter color (khaki, or tan) and lightly dust the gun. This will blend everything together and dull the finish. Your color palette will depend on the operational environment. When weapon is completely dry, remove all products used during masking and lubricate weapon in accordance with TM 9-1005-319-10 OCT 1998. If you lube painted surfaces the paint will deteriorate. Wear spots or scratches can be touched up without completely stripping the weapon. Disassemble the weapon and remove the bolt carrier assembly. Remove handrails. If the weapon has rails you can remove the paint with the rails attached to the upper receiver. 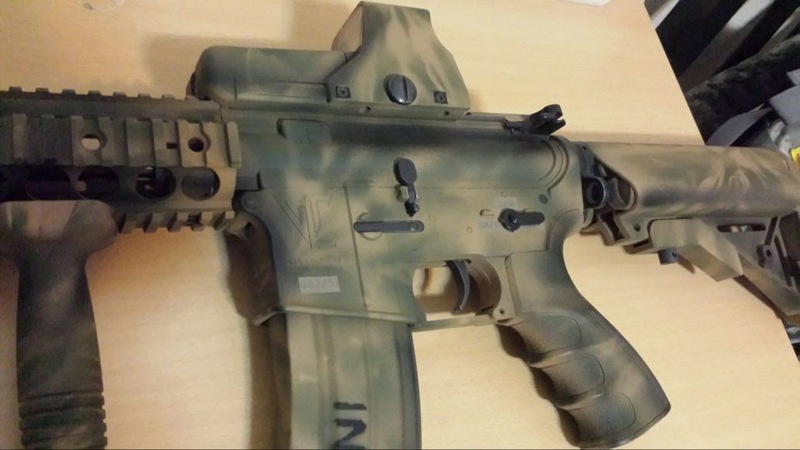 Thoroughly spray exterior surfaces of upper/lower receivers and handguards with CLP. For best results, wait 60 minutes to allow CLP to react with painted surfaces. Use the general purpose brush to clean all exterior painted surfaces. If paint still remains on surface of weapon, apply another coat of CLP and wait. CLP may be left on painted surface for longer than 60 minutes if needed. Once paint is fully removed, clean weapon with dry cleaning fluid following all safe handling precautions as per regulations, reassemble and lubricate. For more information on weapons painting, refer to TACOM CLMC MI 10-040 on the Army Electronic Product Support (AEPS) website. You can also contact your local TACOM LCMC Logistics Assistance Representative (LAR) or your State Surface Maintenance Manager for assistance. There is no doubt that weapons painting is about to be elevated to a fine art. Anyone who has spent time in theater knows that some units haven’t waited for a formal policy to allow troopers to camouflage their weapons with paint. Some of the results have been impressive, while some results have been mixed. The bottom line, however, is that it’s more important that a weapon be functional, than “invisible.” Before you break out the spray paint, be sure to protect your weapon so that your weapon continues to protect you. Si alguién está pensando en pintar la suya si quiere le puedo dar algunos consejos o ayudar a pintarla. Muy buena la información, gracias Mani.